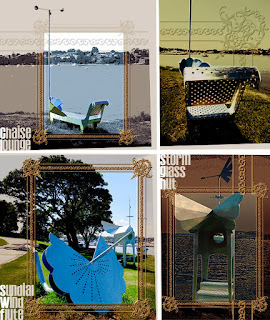 I had the pleasure of being invited to the official launch of a sculpture at Cabarita Park on Sunday 9 June last.. The three whimsical works reflecting on climate were really intriguing ... and you get to sit on, stand in, look through and listen to them. This photo is a close up of the storm case window. It contains a salt solution which reacts to barometric pressure and was an old time way to see whether a storm was coming. It is part of the storm glass hut in the photo below. This launch was the final event in the Reclamation project. Part of the project included some wonderful music. You can see more here and hear the music too! The work is titled “The Observatory”, by Heidi Axelsen, which comprises of three pieces of art aimed at enabling visitors to experience the natural elements in a novel way. The Storm Glass Hut - This is a storm-glass barometer and weather vane to see the direction of the prevailing wind. The Sundial Wind Flute - This is a listening device to hear the sound of the wind and also the tell the ttime through the integrated sun dial. The Chaise Lounge Observatory - This provides a comfortable place to rest and observe the area, incorporating a small wind turbine to show the speed of the prevailing wind. 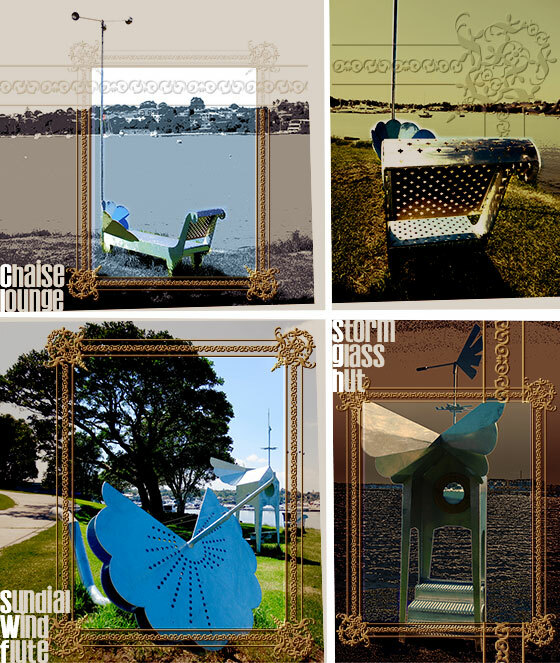 The artworks, located in a group of three, are a triptych, that relate to one another and create a destination. The works are inspired by the local history of Corry’s Pleasure Garden, 18th century scientific devices for measuring the weather and a Victorian aesthetic.